Service Viburnum (Viburnum utile) is a small shrub that is native to China and used in landscapes in the US. The cultivar ‘Chesapeake’ is semi-evergreen in the northeast US, with shiny winter leaves that range from dark red to dark green to warm brown to almost black. Redosier Dogwood (Cornus sericea) is a shrub that is native to most of North America. 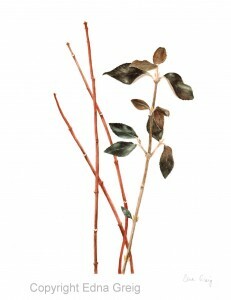 It has bright to dark red stems that are especially noticeable in winter. Both of these shrubs grow in my garden and brighten the cold days of winter. The shiny dark leaves of the viburnum contrast nicely with the smooth red twigs of the dogwood. This painting was done with mostly M Graham transparent watercolors on Fabriano Artistico Extra White 140 lb hot press paper. I used white colored pencil to draw the leaf veins.